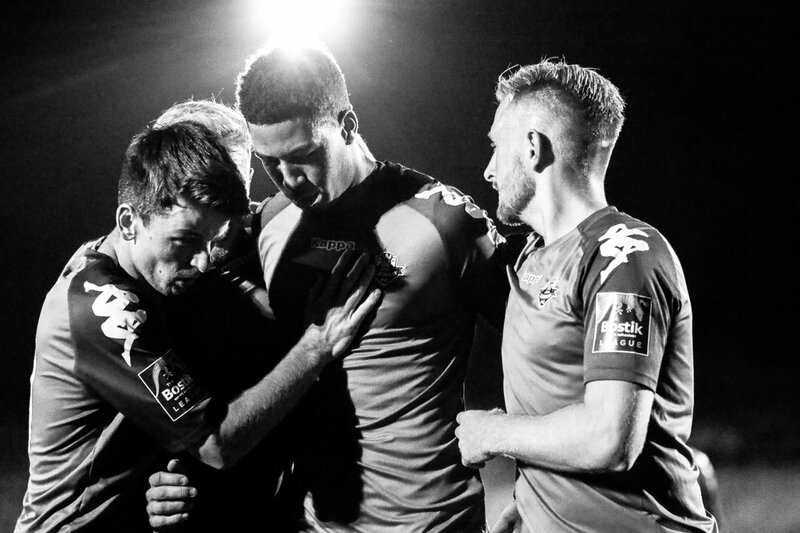 A first-half penalty from Jonte Smith helped Lewes to a hard-fought 1-0 win in the Sussex derby at local rivals Whitehawk, reports Tom Harper. Darren Freeman made one change to the side that beat Folkestone Invicta 2-0 in their previous game, with Harry Reed replacing Frankie Chappell in the starting line-up. This change allowed Tom Day to return to his preferred position of centre-back, with Reed playing at left-back and Stacey Freeman captaining the side in the absence of Chappell. Shooting down the hill in the first half, Lewes had the better of the opening stages, with Ronnie Conlon heading a Michael Dome-Bemwin cross from the right just wide inside the first few minutes. Dome-Bemwin was getting forward well early on, and saw a long-range effort comfortably saved by Melvin Minter in the Whitehawk goal as the Rooks remained in the ascendancy. Lewes should arguably have taken the lead midway through the half, as Luke Blewden capitalised on an error by Ronayne Marsh-Brown to beat Minter to a long ball forward before cutting the ball back to Omarr Lawson, who saw his attempt blocked by a covering defender. The game became end-to-end as the half progressed, with former Lewes player and current Whitehawk captain Henry Muggeridge drawing a fine save from Lewis Carey with an effort from the edge of the area that seemed set to find the bottom corner at the end of an incisive counter-attack. The Rooks were handed an excellent opportunity to take the lead eight minutes before half-time, as Whitehawk defender Aaron Goode inexplicably handled a searching crossfield ball from Blewden in the area. Jonte Smith converted the resulting spot-kick, waiting for Minter to dive to his right before coolly placing the ball in the opposite corner to put Lewes in front. Whitehawk nearly equalised immediately, with Lucas Rodrigues getting free down the right and delivering a teasing low cross that rolled across the six-yard box and somehow evaded two onrushing team-mates. The hosts started the second half brightly and had a great chance to equalise 11 minutes after the break, as Reed was adjudged to have fouled Rodrigues in the penalty area. Jason Williams took responsibility from the spot, but dragged his effort wide of Carey's right-hand post. Williams had another very presentable opportunity to level the scores barely a minute later, making the most of hesitant defending from Tom Day to latch onto a long ball forward before shooting wide of the far post with only Carey to beat. Whitehawk were dominating possession shooting downhill towards their vocal supporters, but were finding it difficult to turn this into clear-cut chances against a back four superbly marshalled by the outstanding Day and Stacey Freeman. Their best chance to equalise came with four minutes remaining, as Ed Sanders met a Muggeridge free-kick with a thumping close-range header which Carey did superbly to get a hand to and help over the bar. Lewes survived a succession of corners and long throws during the remainder of the 90 minutes and four minutes of stoppage time to record a third consecutive league win. This was an impressive result for Lewes, who weathered long periods of pressure during the second half to hold onto the lead they gained before the break, before celebrating with the large contingent of travelling fans at full-time, who appeared to make up at least half of the 612-strong crowd. Post match Darren Freeman was very pleased with the result when he spoke to Barry Collins. The Rooks take a break from league action this weekend to travel to Ashford Town (Middlesex) in the FA Trophy first qualifying round, kick-off at 3pm. Whitehawk: Minter, Goode, R. Marsh-Brown, Emberson, Shooman, Sanders, Rodrigues (Drage 65), Muggeridge, Williams, Ky Marsh-Brown, Sisimayi (Moore 73). Unused Subs: Hallard, Broughton, Kw Marsh-Brown. Lewes: Carey, Brinkhurst, Reed, Dome-Bemwin, Day, Freeman, Blewden (Darbyshire 66), Lawson, Smith (Elliott 59), Conlon (Appau 83), Hammond.